Keeping algae at bay in a water trough is often a real chore, especially if it is located in the full sun. 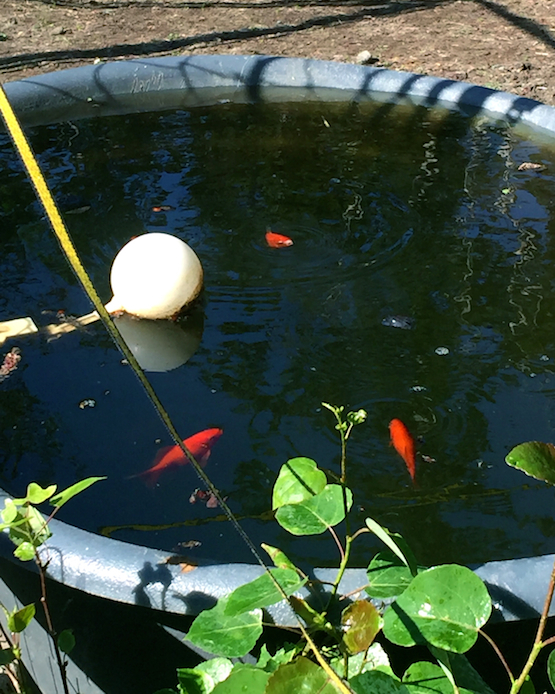 I have introduced gold fish into all of my outdoor water troughs and am pleased to say that it has been an absolute success. The fish are not some sort of an exotic species, they are the very inexpensive "feeder gold fish" that can be purchased at almost any pet store. I am very proud of the fish featured in the photo, they are going on 4 years old and that is old for Alaskan gold fish. Yes, I do keep the trough heated during the cold winter months here in Palmer, Alaska. By the way, I have never fed the gold fish. They thrive on bits and pieces of feed left by the goats as they drink, and of course, from the algae. Hope you'll give this, it's efficient and fun! This is exactly the solution I have been needing!! Thank you so much for sharing. I assume you have to aerate the tank? Any other tips for someone clueless about carcaring for fish?